I want to share a few things I love about #running. Will you bear with me a few minutes? This won’t take long. When I think to myself, “I’ll go running today,” my body sort of jumps with excitement. It’s like you just asked your dog, “Do you want to go for a ride in the car?” There is a cost in energy and time, for sure, but the benefits outweigh any downside 10 to 1. My body yearns for the run now and that feels pretty good. I love the new spring and power in my legs. They aren’t chumpy stumps anymore. I usually start out my runs with a climb. My favorite long run starts out with a gain of about 850 feet over the first three miles. I love an uphill challenge and it’s fun to beat my old splits on that part of the route by even a minute. I love it when my stride and breathing are perfectly in rhythm. It’s like the cylinders are firing in sync. And I love how when I am running on flat ground at an easy pace, I breathe normally, as if I wasn’t even running. When I first noticed that, it astonished me. I love breaking the “sweat barrier.” When I bust past that, I feel like I’m on a natural high, an earned high—nothing cheap or artificial but something real, something that lasts. I love to pour out my heart in gratitude and prayer while I’m out. I can’t bring myself to listen to music. I prefer to listen to a different kind of music when I run, the music of the soul. It’s an intoxicating kind of peace and I love it. I feel cleansed, spiritually and physically, when I’m done. There is nothing like it. The sweating helps a lot with toxicity (I have heavy metals toxicity—long story) and the increased, sludge-cutting circulation seems to make my mind and heart clear. Most of all, I love defeating old perceptions. You can do what you never thought you could, become what no one thought you could. I like those kinds of surprises. I like conquering old “records.” I feel free. It’s like I found the key to my jail cell and let myself out. You can do it too. Just start. Run a half mile, even just a quarter mile. Begin at a walk if you have to. Start and keep after it. If I can do this, you can. Why not? I remember the day my running changed. It was April 16, 2014. I’d had a particularly good day. I took off for a run after work and kept going and going until I discovered I’d run seven miles. I felt like I could have gone further, but seven miles in a single run was a record for me. I am so grateful to my Heavenly Father for restoring my health and giving me the encouragement and the will to try. 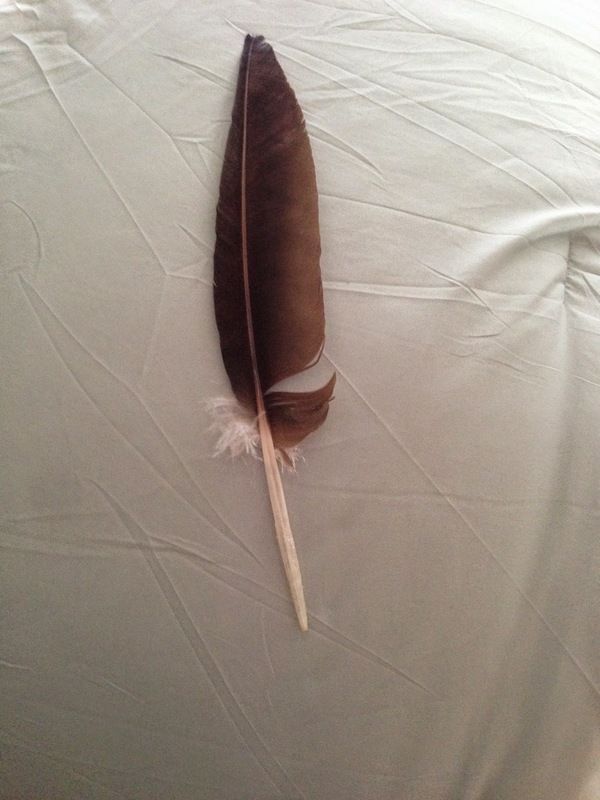 I found a feather on my run that day. It’s 16 inches long. I don’t know what kind of bird it came from. Maybe it’s just a turkey feather. I don’t care. I kept it as a reminder of the day I found that secret current of air, when heaven exhaled and my feet left the ground. Running is a bit of heaven. This post makes me want to jump up right now and start running. But alas, an injured knee is stopping me. As I have read your blog over time, I am happy for you and where you are at physically. It's inspiring. Previous Previous post: How Much Is a Pass-Along Card Worth? Next Next post: Is There a God?